It was a treat to receive news from Edualdo & Aline Cicero of VISION DE LA MOISSON (Vision of the Harvest - Tahiti). "This is to express how thankful we are for the great books we just received including those we have received over the years. It has always been a blessing and will continue to be. We live at the very ends of the earth in the middle of the Pacific and receiving such phenomenal literature brings great joy and relief. We are indeed very grateful for your generosity and the sacrifice it involves to think of us missionaries. It is also a great testimony of your love and desire to see that many more people get impacted with the immense comfort and strength that sound and uplifting teaching can bring to those who have a calling to make Jesus known. We took with us about 4 to 5 full boxes of books that we have had for a few years and gave them over to the Cook Islands (churches, Youth with a Mission base, individuals, pastors and a seminary training pastors in Avarua). They were so thankful for the books we passed on to them." 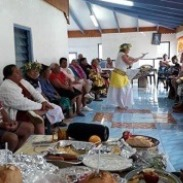 The photo shows the Vision of the Harvest outreach team ministering to their hosts on a visit to the remote Cook Island of Aitutaki.